We had a busy, busy weekend. There was so much fun stuff happening, and everyone knows I hate missing a good party, so we squeezed in as much stuff as we could. Saturday morning started off like this. I'm pretty sure I've said it a hundred times before, but I'll say it again: That dog of ours is the greatest. After Callum tormented George for the better part of the morning, we had his first swim class of the Fall sessions. 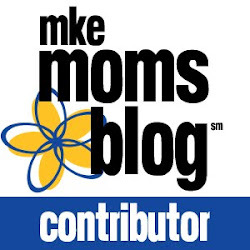 We've been taking swim classes through the Milwaukee Recreation Department since he was six months old. Callum is such a fan. I love seeing how much more comfortable he's gotten in the water, too. He now willingly sticks his mouth and nose in the water, and jumps in to the pool (in to our arms, of course). His best buds are in the class, too, which never hurts. These boys are turning in to little fishes. We spent Saturday afternoon volunteering with Tailwaggers 911 at Barktoberfest. Barktoberfest is a huge dog festival held at the Estabrook Park Beer Gardens. It turned out to be a perfect day for it! In addition to Callum and George, we also brought an adoptable Tailwaggers pup with us. Her foster family was unable to attend the event with her, so we got to be in charge of showing her off at the festival. Let me tell you, we were happy to spend the day with sweet Luna. After looking at her, I'm sure you'll agree. You guys. She was the sweetest! She's a four month old terrier/beagle mix, and she had quite a few admirers at Barktoberfest. I have a feeling she's going to be with her new home by the end of this week. In probably one of the most bizarre moments of my life, I saw a tortoise in a tutu. Not even kidding. Anyways, I guess you can adopt them. The dogs had no idea what to think. I guess their scent really bugs the dogs. 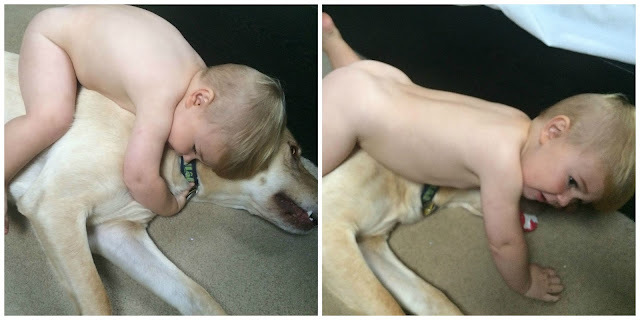 So, a dog gets close enough to get a good whiff, and then almost jumps away. It was pretty hilarious. They all stayed pretty curious about them, anyways. They just kept their distance. George and Luna checking out the tortoise. 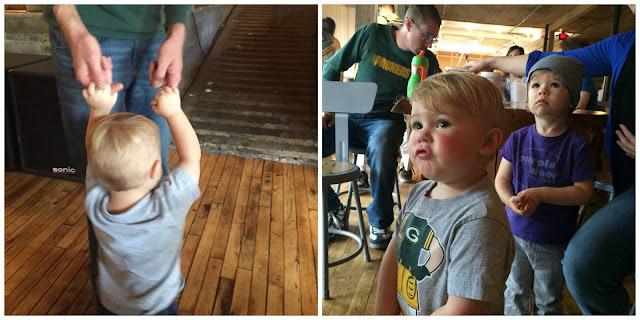 Sunday morning, we went to watch local kids band Fox & Branch at Anodyne Coffee. I know I've mentioned it before, but in case you missed it, this is one of our favorite things to do with Callum. He loves music and dancing so much, so this is right up his alley. He spends the whole time dancing and clapping his hands, while Matt and I get to enjoy some coffee and chat with friends. Win. Win. Plus, Anodyne in Walker's Point is just gorgeous! Sunday's show wasn't as crowded as usual, too, which was nice. Had to take a quick dance break to hold sweet Maisy. For the first time ever, while Fox & Branch were playing, we watched Callum walk up to another kid his age and just give him a high-five. It was out of nowhere. I don't think I've ever been prouder. It was such a toddler bro moment. It's so funny to watch him interact with other kids. It just makes him seem to grown up. I feel like he's 2 going 16. Fox & Branch's next show at Anodyne is October 25. Hope we'll see you there!